The movie doesn’t actually come out until August , so that part will mainly consist of my predictions based on the trailer. But let’s get started with the basics first! When I first watched the trailer for The Hundred-Foot Journey, I decided that I absolutely had to see the movie. Most people might think that it’s because it stars Dame Helen Mirren or because it was directed by Lasse Hallström and produced by Steven Spielberg and Oprah Winfrey, but my main reason is actually Manish Dayal. I still remember his performance as Raj in 90210 and how I really started caring about a character of that show for the first time. I cannot wait to finally see him in a major role in a Hollywood movie, especially if it’s with such a great team. So, after I found out that the film is based on a book, I read it as soon as I could get my hands on a copy with a movie cover. 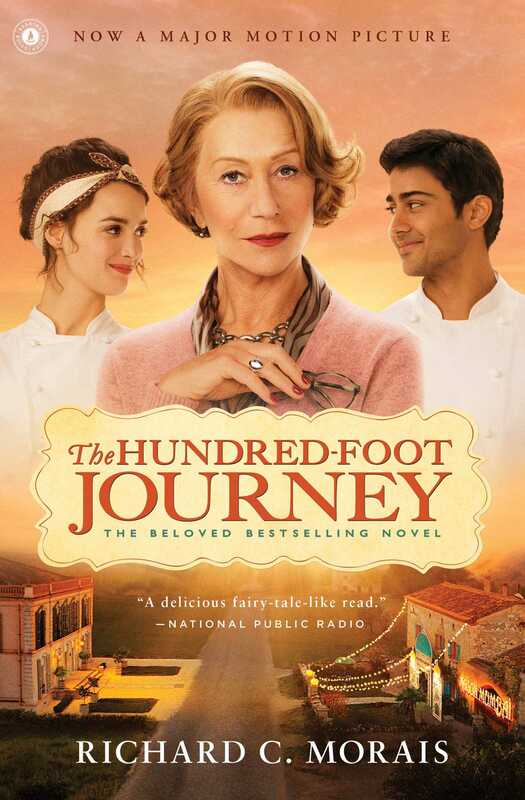 The Hundred-Foot Journey is the culinary coming-of-age tale of Hassan Haji. I think that this one sentence actually sums it up quite nicely, because it should work for both the book and the movie, while I don’t think a lengthier description would be accurate for both, but I’ll get into that a little later. Let’s start with focusing on the book. I really enjoyed reading about Hassan’s journey! It definitely brought me back to the time I was working in a hotel in France for a couple of months, and I love the book for being able to do that! The story (written by Richard C. Morais) is divided into four parts, each representing a different city/town (Mumbai, London, Lumière and Paris) and also part of Hassan’s life and growth as a person. The whole tale is told from Hassan’s perspective, although he starts the story with his grandfather’s life way before he was actually born. There were some amazing moments in the book where I really felt with the characters, but I did have some issues with the pace of the book. With a bit over 250 pages, it is not the longest book I’ve ever read, but it still covers (including the grandfather’s story) about 90 years. That’s a lot! I just wish the author would have focused on one period of Hassan’s life instead of flying through all of it. Which directly brings me to the differences that I predict for the movie. From what I saw in the trailer, the movie especially focuses on Hassan’s time in Lumière, where he met Madame Mallory, and I think that’s a great idea. They generally seem to have changed the storyline a bit and Madame Mallory’s past as well, but I don’t think it is necessary to stay too faithful to the book to portray what’s important. Also, there seems to be more romance involved than there was in the book. In my opinion, it really looks like a perfect summer movie with a great cast and crew. But you can watch the trailer below and tell me what you think yourself! Final tip from me: Don’t read the book or watch the movie when you are hungry! I saw an ad for this. I hope you have a good time when you go to see the movie. Thank you! I’m usually pretty good at enjoying the movie and the book seperately, so, I’m hoping for the best. That’s what we all hope when we go to a movie, isn’t it? When I first saw the trailer, I too was run mad to read the book. However, I was startled that it seemed so different from what I imagine the movie will be like. The one thing about a movie is that you are rewarded with sights and sounds; too bad we will miss the aromas and tastes of that lovely cooking! I learned so much about India of the times. I admit having to look up some terms, but that’s part of reading, isn’t it? Learning new things is such fun. I still look forward longingly to seeing the movie. Thanks for your review of the book. Yeah, I just had to have the book after watching the trailer. I also imagined it a bit different, but I still very much enjoyed it. I’m so going to get hungry while watching the movie, even without the actual aromas and tastes! Thank you for sharing your thoughts here :D!